2. 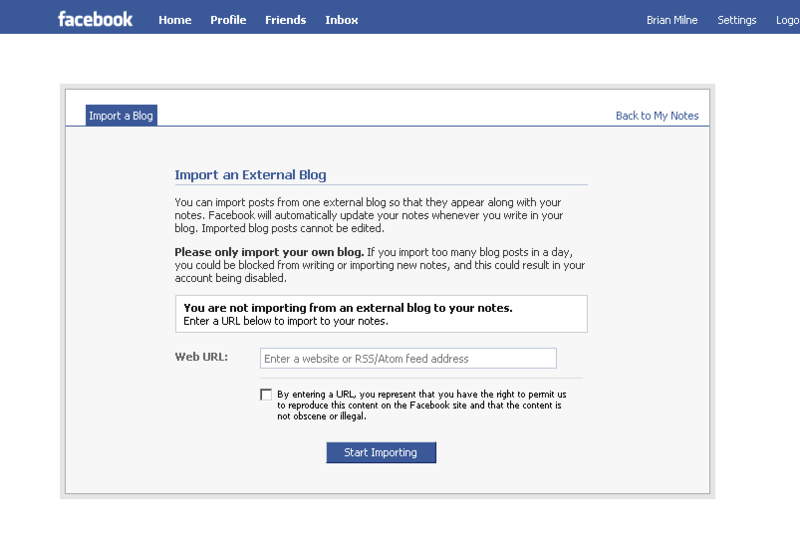 Click "Import a blog »", which should bring you to the "Import an External Blog" page. Enter the RSS address in the Web URL field and accept the user agreement -- confirming that you are in fact the owner of the content you are importing. On the next screen you'll see a preview of your imported blog posts. If you like what you see, confirm the import. If not, cancel. Moving forward, Facebook checks the feed every hour or so for new posts you've published and will add them as Facebook notes. From the http://www.facebook.com/editnotes.php? page, you can change your notes settings from the Settings pulldown in the top nav, making notes visible to "only me, only friends, friends of friends, everyone, or customize." NOTE: It should be noted that depending on the publisher of your RSS feed, your initial import may only include the most recent entries from your blog. This is likely occurring because the feed is providing only the most recent posts, and Facebook won't be able to access, or publish, your archived posts. ... Also, some feeds have been known to create duplicate posts upon the initial import. This is a bug that has been reported to Facebook. You can simply delete those duplicates once the import is complete and it's usually not a problem on future posts. If your RSS feed injects duplicate notes, Facebook asks that you report your RSS URL. 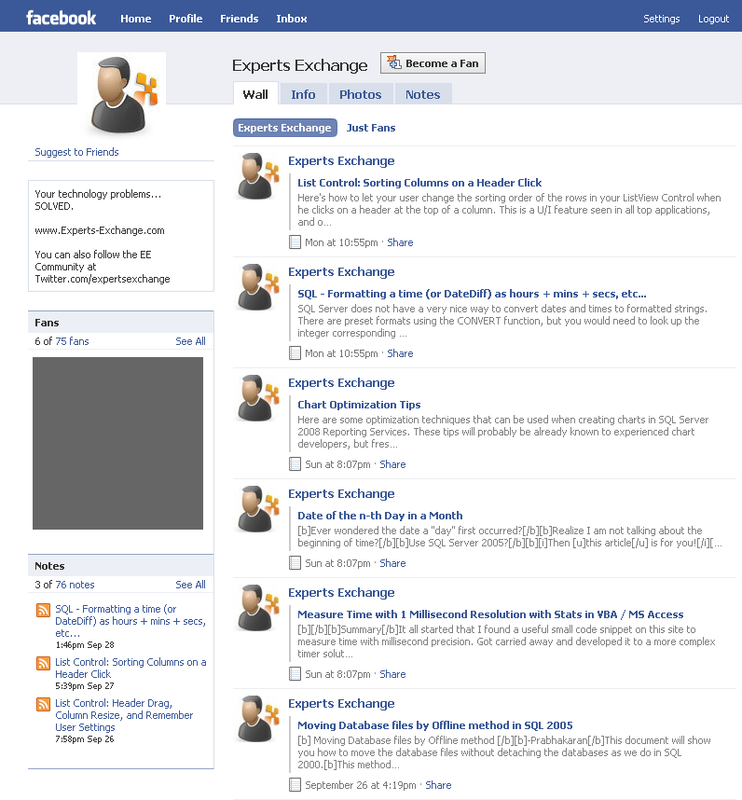 To see an example of how RSS feeds end up looking on a Facebook page, check out Experts Exchange's Facebook page, which publishes notes of the latest EE Articles. While you're there, become a fan of the site. And if you have a solution to a common question like this on Experts Exchange, write an Article about it. You'll not only get points, but help out the community in the process ... and by linking to your Article, you'll save yourself a few keystrokes next time you go to answer that question, again.